The Historical Atlas of Maine has received three new awards, bringing to four the number of honors presented to the folio, its editors, cartographer and publisher this spring. 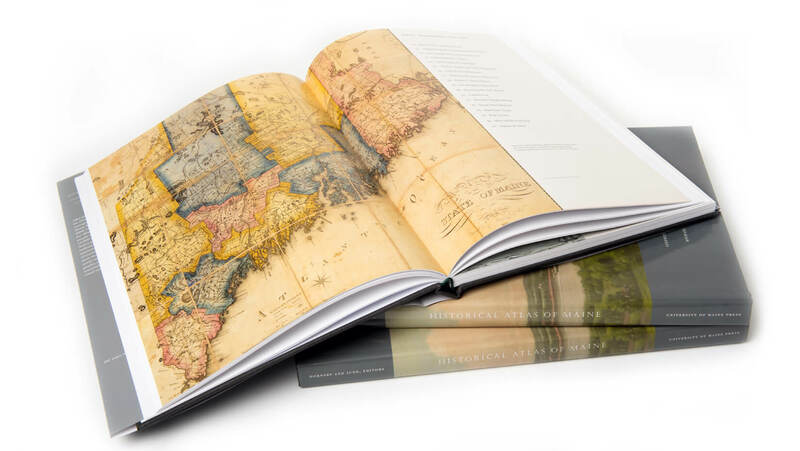 The atlas won the best Book/Atlas category and was named Best of Show by the international Cartography and Geographical Information Society, and received the Excellence in Publishing Award from the Maine Writers & Publishers Alliance. In February, Historical Atlas of Maine received the 2016 American Association of Geographers Globe Book Award for Public Understanding of Geography — one of the two most distinguished book prizes available in American geography. The atlas, the result of a 15-year scholarly project led by University of Maine researchers, offers a new geographical and historical interpretation of Maine, from the end of the last ice age to the year 2000. The volume was published in 2015 by University of Maine Press, a division of UMaine’s Raymond H. Fogler Library. The folio-size Historical Atlas of Maine is edited by UMaine historian Richard Judd and UMaine geographer Stephen Hornsby, with cartography by Michael Hermann. It tells the principal stories of the many people who have lived in Maine over the past 13,000 years — the history of Native peoples, European exploration and settlement, the American Revolution, Maine statehood, agricultural and industrial development, and the rise of tourism and environmental awareness.